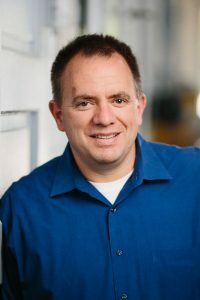 College of Engineering Dean Sarah Rajala has named Frank Peters, associate professor of IMSE, interim chair of the Department of Industrial and Manufacturing Systems Engineering. The appointment follows the retirement of Janis Terpenny and will continue until a permanent chair has been chosen. An added responsibility this year will be managing the Iowa Board of Regents Academic Program Review. Peters has led a number of departmental improvements during his time at ISU, including the developing three of the required courses in the core IE curriculum and working with industry to create sales engineering courses and a minor program. Since 1999, he has been instrumental in sharing five manufacturing laboratories with mechanical engineering to allow both departments access to more equipment when needed. Peters is also the program coordinator for ISU’s study abroad partnership with the University of Limerick. He received the College’s Superior Engineering Teacher Award in 2012. Some of his research highlights include manufacturing systems improvements in the metal casting industry and for wind turbine blade manufacturing. Peters is also assistant director of Iowa State’s Industrial Assessment Center.